Today I'm really excited to present you the interview I did with the great South-American artist last summer. It's been a pleasure for me and I hope you will enjoy the reading. When did you first encounter the world of comics and when to did you decide to make comics yourself? 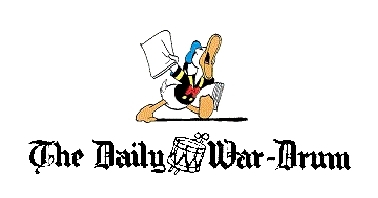 I was a very young child when my parents bought me comic books as Donald Duck or Billiken, a weekly magazine who brought many good European comics, including Arthur le Phantome and Argentine characters. As Pi-Pío or Pelopincho y Cachirula. Many years later, I found that Donald Duck cartoons that I liked, were what made Carl Barks, the greatest artist that I took as model when I had to draw Donald Duck for Egmont. What kind of comics have you grown up with? I mean, what comics did you like to read When you were young? As I got older, I liked to read comic adventures, including Johnny Hazard, Alley Oop, Tex Willer, made in Italy, Blake and Mortimer, Dan Cooper and Umpah pah, French, and the Argentine Misterix, Hora Cero, Frontera and the magazines of Editorial Columba; also Batman, of course, and other super heroes. Do you consider comics as an art? What is, in your opinion, the "role" of comics in modern society? Yes, comics are known as "the ninth art" and for me, it's true. It is a special combination of pictures and words that tell a story in a new way, Twenty Century own parallel to cinema. Great artists like Barks, Hector Oesterheld, Hugo Pratt, Alberto Breccia, Quino and Moebius, have created works of art that are as worth as the best literature, painting or film. Are you autodidact or did you attend some art school? Who are the main artist you are inspired by? I'm kind of self-taught, although when I was ten years old, I studied by correspondence (I lived in a small town, Villa Ramallo, distant 200 miles from Buenos Aires, Argentina, where I arrived just at 18 years), with Continental School School, which used many lessons of animator Preston Blair. When I arrived to Buenos I studied with great illustrators as Pablo Pereyra and Angel Borissof, but more than anything, I learned working as an assistant to a great cartoonist: Lito Fernández and from there, since the late '70s, publishing on my own. 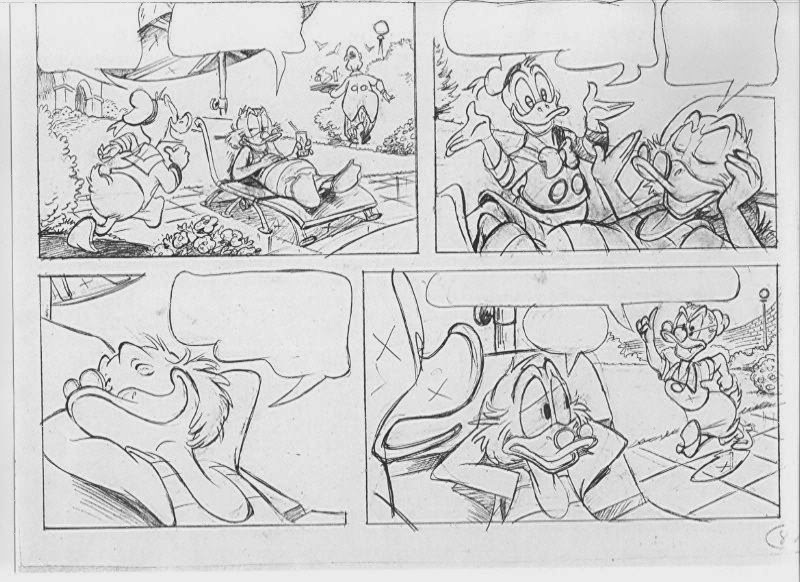 Years later, in 1995, I again had a great teacher, when Daniel Branca supervised me in my work for Egmont and revealed the secrets of the Barks style and his own, when I was able to start drawing comics of Donald Duck. If I have to choose an artist as the model that I followed throughout my career, that's Pratt. 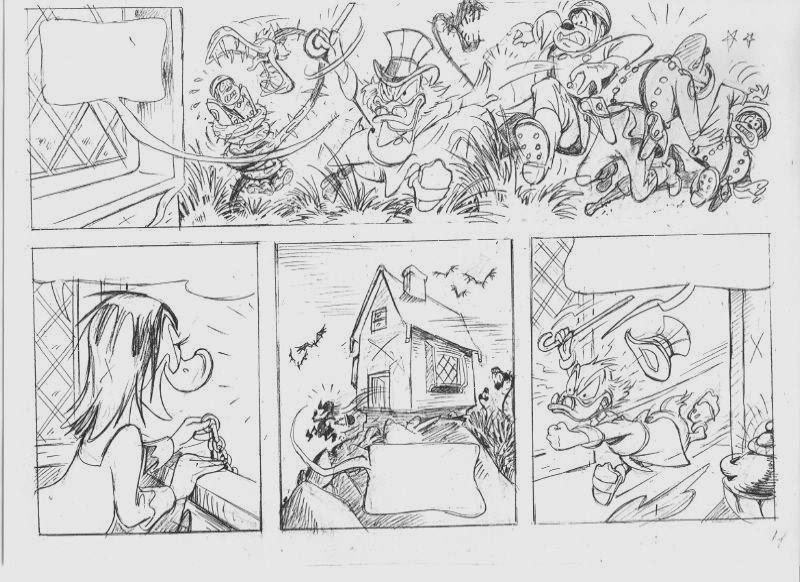 Taking for example a story of Donald Duck: which is your usual method to build a page? I read the script until I look like I've written myself and I seek some necessary documentation and study it. Then I sketch all the story once. From there, I take a page and draw it as best I can, then another page, etc. the next day, back on the pictures and I correct, retouch, improved everything I can. 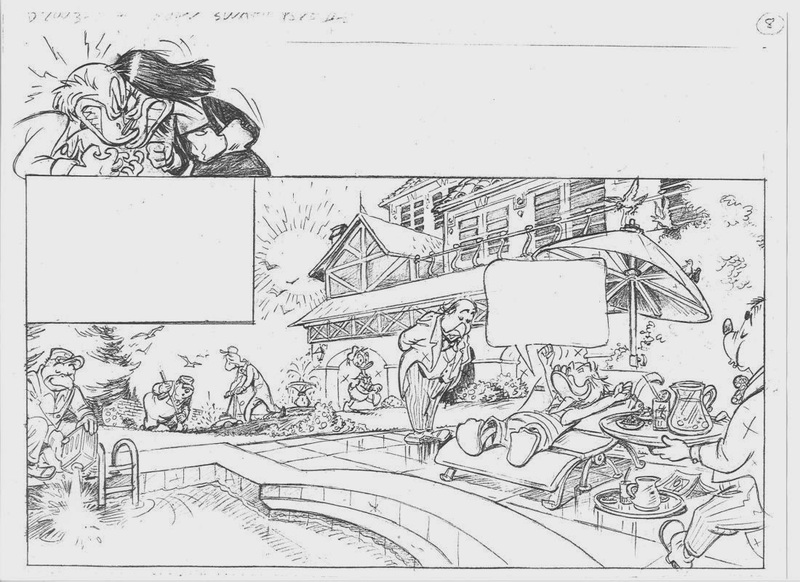 I keep well until the whole script is done, at which point do an overview of the entire comic, before handing it to the inker, which can be Raúl Barbero or Ruben Torreiro. When I get ink past work, back to reviewing, updating, correcting ink until I'm satisfied. For me, it is important to identify with the characters and feel their emotions, for to be able to interpret them properly. Many times, I am inspired by friends or people known to create the secondary characters. How do you see the situation of comics in society nowadays? Will there be, in your opinion, to good future for them? This is a very different time to when I started with comics. In my country are missing the big publishers who edited many magazines and comic artists should work for Europe or United States for the most part. Internet greatly facilitates the latter. A good thing is that one can develop his style and publish directly to the web, without the constraints imposed by large publishers houses. I don't know what will happen in the future. I see that cartoon motion is becoming Motion Comics and other things that do not interest me too much. For me, there is nothing better than pencil, paper, ink and black & white. Often excessive computer colored cover the drawing, it vanishes. There are many talented young people, no doubt, often published in book form, directly, without going through magazines. However there will always be comics, I think. Which are the artists you would like to suggest to read and to know? Carl Barks is immortal, he is a master in everything he does and also I'm laughing out loud every time I read one of his stories. Branca was a great artist and his drawings also cause an irresistible grace. Other artists I like, in realistic style: Alberto Breccia, Dino Battaglia, Arturo del Castillo, Mike Mignola, Frank Robbins, Joe Kubert, Jack Kirby, some stuff of Frank Miller and the classics: Foster, Raymond, Cannif, and always, always, Hugo Pratt. If you would like to add anything about yourself, your education or your career, you are free. the many followers of your blog, I will feel that I have new stories to tell and draw.It gives me much pleasure to answer these questions, because I love comics and also because they come from the region of Italy where my grandparent. Carlo Massaroli, were born: Bobbio, Piacenza. Thanks for reminding me of the beautiful places they come from! Courtesy of José Massaroli for the images. (C) Disney. hai visto che sul primo volume della Scarpa library c'è il disegno di Gedeone che ti ha fatto Daan Jippes? ho visto e ciò mi ha fatto molto piacere.